Have you ever considered a career in Recruitment? Are you at a stage in your professional life where you’re no longer fulfilled in your current role, for whatever reason? Or perhaps you have recently graduated from Uni and deciding what’s next? Maybe you just want a new challenge in life? Whatever the situation, or whatever your current circumstances have you ever considered a career in recruitment? If not, why not? Recruitment is an industry that has been around since the 1940’s, as a result of many going to fight in World War 2 there left a number of opportunities open within communities and local businesses which then lead to the birth of Recruitment Agencies. Over the years the industry has grown and developed and there has been an increase in the number of new agencies starting up. It is a lucrative industry, but not everyone has the staying power, of all the thousands of new start-ups only a small percentage go the distance. Calco has been established for over 30 years and over those years we have learnt the ins and outs of working in the Construction, Property and Engineering recruitment sectors but the learning never stops! We want to continually grow and develop as a company so we are reaching out to you to join us on this journey! At Calco you are encouraged to work hard to achieve your goals are well as company goals! There is clear progression here, want to eventually become a Team Leader? Operations Director? Or even a Director!? The possibility, direction and support is there-as long as you work for it! A large part of recruitment is building and maintaining candidate and client relationships, so if meeting new people and becoming a familiar face to those whose careers you are improving and supporting then this is the place to be! Of course-money and bonuses are the top of a lot of people’s lists when it comes to why they want to pursue a specific career-Yes making money is a huge driving force and motivator and keeping this in the back of your mind could ensure you work hard to be the best recruiter you can be and see the financial rewards of this. Company parties, industry events, Quarterly dinners, team nights out, candidate and client meetings-there are plenty of opportunities to socialise here at Calco! As well as getting out and about and socialising we also encourage the use of social media-So if you are keen on Snapping, Tweeting, Liking, Sharing etc you will fit right in! If you want to feel part of a team, then Calco is the place to be! Yes, we believe in individuality and everyone being their own person and bringing something unique to the table, but if you need that extra moral support or a drink after work to vent about a hectic day you will find it here. We celebrate successes together, we also support and work through and negatives together! Recruitment is such a fast paced industry and every day is a learning curve if you want it to be. Whether things go your way, or whether they don’t there is always something to learn from that. There are industry events we encourage everyone to attend, podcasts to listen too, articles and books to read-the learning doesn’t stop until you do! Our office is located 2 minutes (if that!) from East Croydon station so we are so easily accessible whether you are coming via train, tram or bus. Transport links into the City and beyond are excellent so attending meetings and events are never a hassle. As well as the transport links we are a 5 minute walk from the now infamous Boxpark (you MUST have seen the videos doing the rounds during the Worldcup!?) There is literally something for everyone here in Croydon so all needs are met! Making a difference to someone’s life is a feeling everyone would say is an amazing one, so why not join a company where this is at the heart of what we do! At Calco ‘It’s all about the people’ and we put this into practice daily. Whether it be helping a candidate find and secure their dream job, or sourcing the ideal professional to fill a client’s role you can achieve the feeling of fulfilment over and over. We also regularly raise money for charities, this is something we pride ourselves on-giving back to others. We encourage everyone to strive to be at their best, in order to do this training and development is something that is done regularly and continually-the ability to grow and learn more never ends. If you want to guarantee you are setting the pace within your sector you can do that here! Be a thought leader, be the recruiter competitors wish they could be, constantly invest in your ability as a recruiter and you will reap the rewards. Last but by no means least, yes training, job fulfilment, money, location etc they are all hugely important reasons to pursue a career-but the added extras is the icing on the cake! These added extras come in all shapes and forms here, it came be drinks and nibbles in the office to celebrate an amazing week, an early finish Friday afternoon, a kitchen full of freshly baked treats-the possibilities are literally endless! 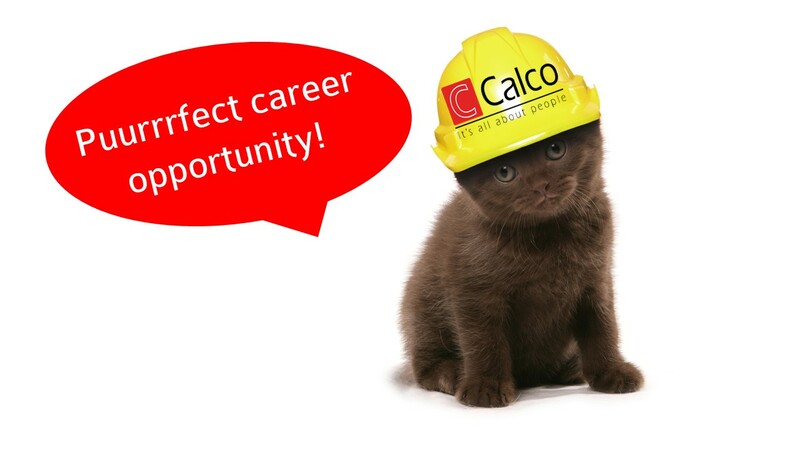 If you can see yourself being a valued member of our team and you are interested in hearing more about what we have to offer you here at Calco please do get in touch today on 020 8655 1600, send up to date CVs to j.carol@calco.co.uk or apply here!